HP LaserJet 1018 is the lowest cost model among other HP's monochrome laser printers. This printer fulfills the needs of a small business or home office who wants high-quality, mono-only text and simple graphics. The device uses HP LaserJet 1018 toner cartridges which yields 1,000 pages at a time without the need of ink to be refilled repeatedly. This is a simple printer weighing 5.8 kg and measuring 8.2 x 14.6 x 9.5 inches, with a sloping top surface and folding paper trays. When the printer is not in use you can fold up the paper feed and output tray so that it does not gear up much space. The device comes with two green LED’s on the top surface, indicating power and attention during paper jam, empty input tray etc.. At the back there is a socket for USB 2.0 cable for connecting the printer with other computer or server. The LaserJet 1018 has a main paper tray that can store up to 150 sheets of paper and a single sheet bypass slot which supports different print media such as business cards, cards, envelopes, plain paper and transparencies. It can print good quality photos for newsletters, printing web pages, and inter-office memos for dissemination of information. 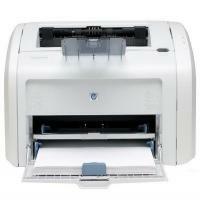 HP LaserJet 1018 is a simple, lightweight machine primarily intended for printing text documents and inter-office memos. It is good for small business or home office but this printer cannot be used in large business as it prints only 12 pages per minute, as compared to similar printers which can print as much as 20 or more pages per minute. What to do if your HP Laserjet 1018 printer’s print quality is not as expected? Gray backgrounds generally appear when print density is too high. Decrease the print density setting through printer properties. This decreases the amount of background shading. Refer Printer properties (driver) from user manual. Change the media to a lighter basis weight. See Printer media considerations in the manual for more information. Check the printer's environment in case you are receiving dark backgrounds. Very dry (low humidity) conditions can increase the amount of background shading. Install a new HP Laserjet 1018 toner cartridges. See Changing the print cartridge for instructions from manual. If toner smears appear on the leading edge of the media, the media guides might be dirty. Wipe the media guides with a dry, lint-free cloth in order to avoid smear problem. See Cleaning the printer for more information. Check the media type and quality. Always prefer to use good quality media to avoid smears. Install a new HP Laserjet 1018 toner cartridges. See how to change the print cartridge for instructions. The fuser temperature might be too low. In your printer driver, make sure that the appropriate media type is selected in such case. Check the media type and quality. Both high temperature and humidity cause media to curl. See Printer media considerations for more information. The media might have been in the input tray too long. Turn over the stack of media in the tray. Also, try rotating the media 180° in the input tray. The fuser temperature might be too high. In your printer driver, make sure that the appropriate media type is selected. If the problem persists, select a media type that uses a lower fuser temperature, such as transparencies or light media. Q. Are compatible HP Laserjet 1018 toner cartridges, like originals, also suitable for HP Laserjet 1018 printer? A. Yes, these compatible cartridges also work as well as the original ones in HP Laserjet 1018 printer. Q. I ordered a wrong toner cartridge for my HP Laserjet 1018 printer. Will you take it back and refund the amount to me? A. Yes, you can return the toner cartridge that you ordered by mistake within 30 days of purchase. Please ensure that the cartridge is unused, wrapped in its original packaging and in a re-saleable condition. After collecting the item, we will check it at our end and once we are satisfied with its quality, we will initiate the process of refunding your amount. Q. I use compatible HP Laserjet 1018 toner cartridges in my printer regularly. However, I saw that the number of pages printed by the cartridge I used last is lesser than usual. Can I know the reason behind it and if my printer has got a problem? A. No, it’s unlikely that your printer has developed a problem. The reason why a variation in the number of pages comes up at times is that the content printed by it may be denser, which results in more ink consumption due to which your cartridge got exhausted sooner. Q. Are HP Laserjet 1018 toner cartridges available for urgent purchase? How early can I get them if I request for an urgent delivery? A. If the cartridges are in stock, external factors like transportation situations are favourable and you place your order early in the day (before 12 noon from Monday to Friday), we can deliver your item in 1 to 2 days. However, if you have a very urgent need, please contact us at 048 30833221 so we can let you know the exact position and when we can deliver your product. Q. I have been using high yielding original HP Laserjet 1018 toner cartridges for my printer. I was wondering if there is any way I could reduce my operation costs? A. You can reduce your operation costs by using our compatible HP Laserjet 1018 toner cartridges that are comparatively cheaper and produce more pages relative to their cost. If you wish to further reduce your costs, you can choose to buy our XL compatible HP Laserjet 1018 toner cartridges that have a higher volume. Q. What is the maximum resolution that HP Laserjet 1018 printers can print? A. HP Laserjet 1018 printers can print up to a resolution of 600 x 600 dpi with HP Enhancement Technology. Q. Are HP Laserjet 1018 toner cartridges compatible with other printers also? A. Yes, there are other printers that use the same toner cartridge model as HP Laserjet 1018 printers. You can find the list of printers compatible with this toner cartridge here. Q. Do you also provide paper that can be used with this printer? A. Yes, we provide envelopes, A4 size white paper, glossy paper, matte paper and glossy photopaper that you can use with your HP Laserjet 1018 printer. Q. I recently ordered a compatible HP Laserjet 1018 toner cartridge from your website. The product was delivered to me on time, however, the toner cartridge I received was damaged and leaking. I need a replacement for this. A. We are very sorry for the inconvenience caused. To get a replacement, please contact us on 048 308332211 or email us on info@printerinkcartridges.ie within 30 days of receiving your product. Just have your order details and invoice number ready and we will guide your through the process. Q. Are colour toner cartridges also available for HP Laserjet 1018 printers? A. No, HP Laserjet 1018 printers are monochrome printers. This means that they only support black and white printing and not colour printing. Hence, you cannot get coloured toner cartridges for this printer. Q. The printer i am using pulls more than one sheet of the paper. Please guide me how can I fix this? A. It might be possible that you have some odd papers that causes this, but most likely, your paper pickup assembly is going bad. The best way is to have them replaced. This is mostly happen when you use small printers as the rollers of them are tiny, and do not hold well. A new assembly will make it print like new. A bigger printer will have larger rollers and will last for longer. That's why we recommend to replace them with best ones. Q. My HP LaserJet printer was jammed, i removed the pages from it and still had an error message. I tried turn off my printer and the ready light is still on. Nothing gets print. What should i do now? A. If you have a Paper Jam problem, you have to make sure that the paper has been removed and that all the sensors are back where they belong to. Look for the trouble in all the input trays, back door, and under the HP Laserjet 1018 toner cartridges. Most of the business class machines show the location of the paper jam that start with "13" and have the other numbers of this range, like if your machine reads 13.1, then you know it is in the front. If you make sure all paper is out, then open the toner door and close it, most errors of this type go away. If not, read the control panel and refer manual for further instructions. Q. How to clean the printer’s print cartridge area? A. The cleaning of the HP Laserjet 1018 toner cartridges should be done very carefully. You do not need to clean the toner cartridge area so often. However, cleaning the area could improve the quality of your printed sheets. Turn the printer off, and then unplug the power cord. Wait for the printer to cool down. Open the cartridge door, and remove the cartridges carefully. Replace the HP Laserjet 1018 toner cartridges, and close the print cartridge door. Plug the printer into the power outlet, and then turn on the printer. Q. I want to purchase HP Laserjet 1018 toner cartridge. How much is it including delivery? Q. Could you tell me how to refill HP Laserjet 1018 toner cartridge? A. Thanks for the question. Unfortunately, we don't have detailed information on how to refill this toner cartridge. Also, we would not recommend to refill these HP Laserjet 1018 toner cartridges by yourself as the toner powder can be hazardous to health. You can buy our compatible HP toner cartridges which have been refilled by professionals and are cheaper alternative to the original ones. Q. Can you tell me if these (HP 12A and HP 12X) work with my HP 1010 laser printer model? A. Yes, these HP 12A and HP 12X toner cartridges are compatible with all the printer models listed on the cartridge page including HP 1010 laser printer and work perfectly fine with them. Q. Will these HP Q612A and 12X toner cartridges work with my HP 1102W printer model? Or do they use different cartridges? Q. Need help on paper tray issue. My HP Laserjet 1018 printer is not pulling paper from the input tray. What should I do? Q. Can you tell me the page yield capacity of these compatible HP Laserjet 1018 toner cartridges? Q. Would I be able to take colour prints from my HP Laserjet 1018 printer if I replace this Q612A black toner cartridge with other compatible colour cartridge? A. The HP Laserjet 1018 printer model is a monochrome laser printer which can only print in black. No other original or compatible colour cartridges are available for it. All the compatible toner cartridges that work fine with your HP Laserjet 1018 printer are listed above on this page. Q. Would you be able to ship these pack of 3 HP Q612A toner cartridges to India?